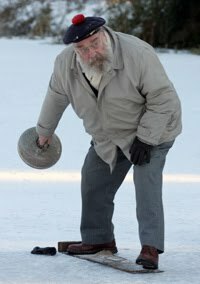 Many years ago, when I first heard the story that WW2 prisoners of war had been sent curling stones so that they could play during their captivity, I was somewhat skeptical. But in 2007 I decided to follow it up, and contacted the National Ex-Prisoner of War Association, who distributed my query for more information. A couple of years later a response was posted in the 'guest book' from family of Captain (later Lieutenant Colonel) R K Montgomery to say he remembered that some POWs in Oflag IX A/H in 1943 and 1944 'flooded the dry moat and then it froze so that they could go curling on the moat. It was a popular pastime'. The story should probably begin with the history of the 51st Highland Division. After serving with distinction in the first World War, the Division was mobilised again in 1939 for deployment to France in January 1940 as part of the British Expeditionary Force. After the initial operations, as the BEF retired on Dunkirk, the Division formed a defensive perimeter around Saint-Valery-en-Caux. In what is described as 'its darkest chapter', the Division was isolated, hoping to be embarked by sea as at Dunkirk. But this was not to happen, the Division was eventually forced to surrender on June 12, 1940, and some 10,000 officers and men became POWs for the duration of the war. The division commander was Major General Victor Fortune. There is a photograph of him beside Erwin Rommel on this page of the official website of the 51st Division describing the events leading up to the surrender at Saint-Valery. General Fortune was one of the most senior British officers taken prisoner in World War II. There's still lots of controversy about what happened at Saint-Valery, for example see here and here. General Fortune, with some of the other Scottish officers, eventually found themselves in Oflag IX A/H in Germany. Oflag was an abbreviation for ‘Offizierslager’. This was a camp just for officers. The camp was in ‘Wehrkreis IX’ (military district 9), which explains the number. Oflag IX A/H was the senior camp at Spangenberg; the ‘H’ being an abbreviation for 'Hauptlager' or main camp. 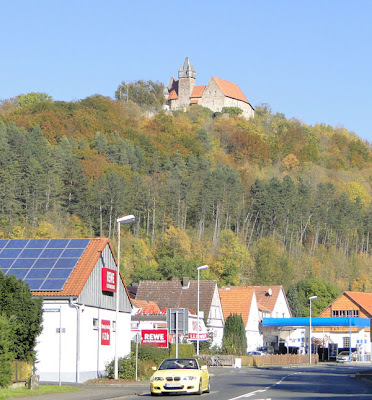 To complicate matters a little, there was an 'upper camp' in Schloss Spangenberg, a thirteenth century castle overlooking the town, and a 'lower camp' in a converted farm in the village of Elbersdorf, close to Spangenberg. A few miles further south at Rotenburg an der Fulda, was Oflag IX A/Z. The ‘Z’ is an abbreviation for 'Zweiglager' or sub camp. Kassel in Hesse is the closest main centre to the camps. 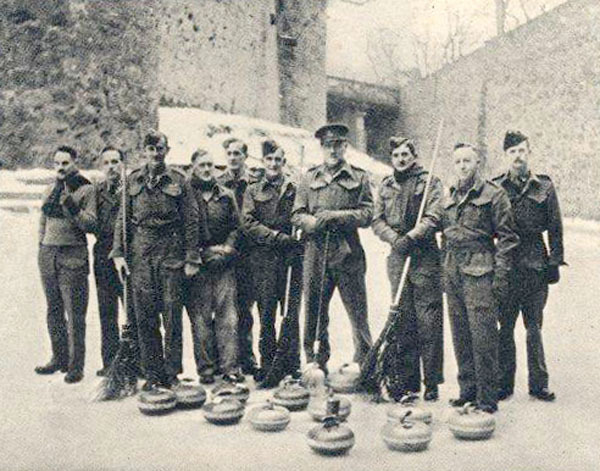 It would have been some time in 1942 or early in 1943 when the Royal Caledonian Curling Club received a request from General Fortune for curling stones to be sent to the camp in Schloss Spangenberg. It is a little unclear just how his request for stones reached long-serving Royal Club Secretary Andrew Hamilton in Edinburgh. It would seem to have originated from Eleanor Fortune (who by this time was able to communicate with her husband in Oflag IX A/H) via Sir Colin MacRae of Feoilinn, who had been the Royal Club's President in 1935-36. He had service links with the 51st Highland Division in his past military career, and probably knew General Fortune well. Andrew Hamilton planned to procure eight pairs of stones and handles in Switzerland, and somehow get them to General Fortune in Germany. This was all organised with the help of Major K M Beaumont of London, a member of the St Moritz Curling Club (and author of Some Finer Points of Swiss Curling, published in 1935). Others involved were Maurice Graham CBE (also a member of the St Moritz Club), and Anton Badrutt of the Kulm Hotel, St Moritz, where curling in Switzerland had begun in 1880 and whose rinks had been home to the St Moritz CC ever since. It was Badrutt who arranged for the despatch of the stones by the International Red Cross Committee, with the involvement of a Mr Vidler, formerly assistant manager of the winter sports department of Thomas Cook and Son Ltd, who in 1942 was with of the Prisoners of War Department of the British Red Cross Society. Between the wars there were many Swiss resorts which offered the opportunity to curl during the winter months. The Annual of the Royal Caledonian Curling Club for 1937-38 lists thirty-nine affiliated curling clubs, many of whose members were British who could afford a winter trip to curl and take part in competitions. Six of these clubs were in St Moritz where at least three hotels maintained their own outside curling rinks. This activity, at least that which involved visitors, ceased during the war years of course, and one assumes that there were a fair number of curling stones 'in store' during that time. Whether the stones obtained at St Moritz had to be purchased, or were a gift, is not known. It seems to me quite remarkable that Andrew Hamilton's plan succeeded! At the Annual General meeting of the Royal Club held in the North British Station Hotel, Edinburgh, on Wednesday, July 28, 1943, it was noted that these stones 'had arrived'. Sir, - May I through your columns express on behalf of the prisoners of war in Oflag IX A/H their very real gratitude to all those who so kindly sent curling stones. My husband tells me that the officers were able to enjoy during the winter some excellent curling and that some keen competitions were played. I have recently come out of hospital in the south and come north to Scotland. My wife tells me that the Caledonian Curling Club was largely responsible for the curling stones which were sent to Oflag IX A/H two years ago. We actually got them through the British Consul in Geneva and I never knew until I got home actually where they came from, although I realised that they were in response to an appeal made by my wife. Actually sixteen arrived, first four, and a little later another twelve. During the winter of '43-44, we had about 26 days' curling; during the winter of '44-45 we had about 30 days' curling. I can assure you that the curling made all the difference to our life in the camp, and we must have taught over 100 Englishmen to curl." The General goes on to explain that the stones were all packed up in preparation for liberation, but would likely have been destroyed when the Schloss was bombed. Lieutenant Colonel Ian Barclay of the Seaforth Highlanders actually attended the RCCC AGM in Edinburgh in 1945 and spoke on behalf of General Fortune and the officers of Oflag IX A/H. Barclay had served in the 51st Division and had been captured at Saint-Valery. (His name is mentioned in passing in the detailed report of Captain DB Laing's escape to Syria after his capture in France which has been printed in this forum thread.) Lieutenant Colonel Barclay provides a detailed account of the curling at Spangenberg. He tells about being able to obtain in the winter of 1942-43 'some rather queer kind of stones, made of wood' that the Bavarians used for a game like curling. These were probably the 'stocks' used in the sport of eisstockschiessen, or 'Bavarian curling', which is still played today, see here and here. "Two years ago we were able to make a start with the curling stones. Our curling, of course, was carried out in a very restricted area in the moat of this old castle in which we lived. You will wonder how we managed that. There was no water in the moat and we had to beat down the snow to make a surface and water it every day and every evening until finally we got a skin of ice on it, and that was where we curled. Unfortunately, one end of the rink was about 2 feet lower than the other end, so you had to keep your hand in when curling down the hill. However, that worked quite well and we had some very good sport indeed. We used to be curling from half-past eight in the morning – that was when we were allowed out of our rooms – and it just went on all day, with a few battles with the people who wanted to skate, until nightfall." The camp contained officers from many countries, not just from Scotland. 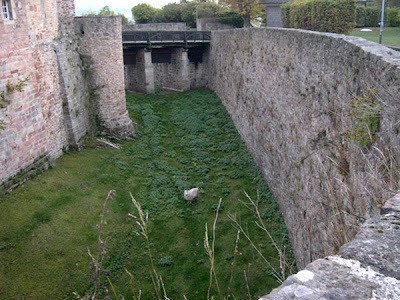 No official records seem to have survived, but it is likely that the upper camp in the Schloss held more than 200 prisoners. That other POWs had been grateful for the curling stones is backed up by a letter sent in 1946 to RCCC Secretary Andrew Hamilton from the Secretary of the Canadian Branch of the Royal Club thanking those individuals who had sent the stones which had been used by 'some of the men from Canada who had been prisoners of war'. The article concluded, "This is a story which is not just as well known as it ought to be. It is a fine example of the interest taken by the RCCC in the ordinary curler and the trouble that the Royal Club will take to assist curlers, wherever they may be, to enjoy their traditional game. Today, there are enthusiasts south of the border who will look back to their first game behind the barbed wire in a foreign land." There are ten persons pictured. General Fortune is easily identified as the tallest of the group, fourth from the right. Perhaps General Fortune and Brigadier Cooper were the two non-playing captains of the two teams? Close examination of the photo shows that rudimentary brooms had been obtained or perhaps made. One wonders whether they played off hacks or crampits. The picture had been found loose in a minute book of the Duddingston Curling Club. Ian Seath suggests a reason for this. Andrew Hamilton, the Royal Club Secretary, who had been instrumental in arranging for the stones to be obtained and sent from Switzerland to Germany, had previously been secretary of the Duddingston Club for eleven years. It can be assumed that he would have been interested in any report of the curling at Spangenberg. But who had taken the photo, and when and where had it been published? Peter Green provides the best answers. He suggests that the most probable source is The Prisoner of War magazine (see an example here). This was published and distributed by the International Red Cross, issued monthly and sent to prisoners’ families. It has been criticised because the Red Cross portrayed a false impression of conditions at the camps and tended not to mention the hardship faced by the prisoners. An 'international curling match' would have been ideal 'feel good' subject matter for the magazine. 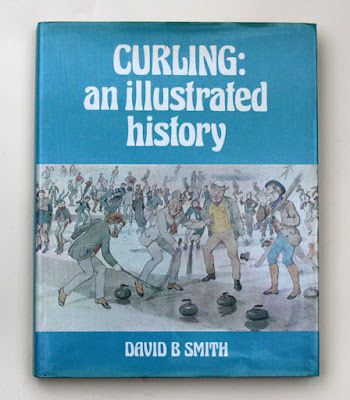 I have been unable to find if a complete archive of these magazines has been preserved anywhere, so that the inclusion of the curling photo in this publication can be confirmed. Peter also informs me that General Fortune and Brigadier Cooper were transferred away from the Spangenberg camp, with other senior officers, in 1944. This means that the photo was taken sometime during the first winter that the stones were available for play, the winter of 1943-44, presumably by a Red Cross photographer during an inspection visit to the camp. General Fortune suffered a stroke sometime in late 1944 (whilst playing badminton it seems) but refused to be repatriated, preferring to remain a prisoner alongside those he had commanded, see here. He was liberated in 1945 from a hospital in Limburg by a US First Army tank column, that story being told by war correspondent James McDowall in the Aberdeen Journal, Wednesday, March 28, 1945. McDowall writes, "When the Americans entered it (the hospital) he was walking about with the aid of a cane, dressed in battledress, and already in command of the establishment." His batman, Private McAllister, who had served with him for ten years, was still at his side. General Fortune received a knighthood in 1945 particularly because of his efforts on behalf of fellow prisoners during his captivity. Major General Sir Victor Morven Fortune KBE, CB, DSO died on January 2, 1949, aged 65, at his home in Dalswinton, near Dumfries. He is buried in Auchencairn Cemetery (on the Solway Coast between Dalbeattie and Kirkcudbright in Dumfries and Galloway), alongside his wife Eleanor (see here). 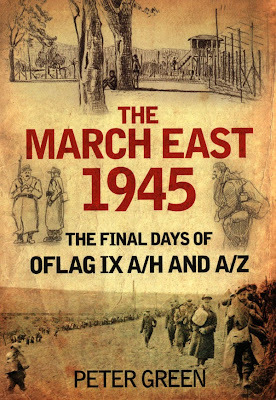 The fate of the prisoners in Oflag IX A/H and A/Z is told in Peter Green's book, The March East 1945: The Final Days of Oflag IX A/H and A/Z, published by Spellmount in 2012. Peter's father had been imprisoned in the latter camp. The evacuation of the camps as the American army approached and the subsequent marches is told in detail and makes fascinating reading. Buy it here. Peter has produced a partial list of those who were in Oflag IX A/H when Schloss Spangenberg was abandoned in 1945 and the POWs marched out, see here. Three of those mentioned in the story above, Lieutenant Colonel Ian Barclay, Captain Montgomery and Lieutenant Colonel Harris Hunter are all on this list. Peter also supplies this further eye witness statement about the curling from his files. It is from Lieutenant Ron Johnson, Glider Pilot Regiment, Spangenberg Upper Camp, "Tried ice–skating and curling. I found curling better, because my skates fell off." This was during the winter of 1944-45. Schloss Spangenberg was bombed by the USAAF and remained a burned out shell until rebuilt in the late 1950s to become a hotel. The photo above, taken in 2010 by Ingmar Runge, shows the view from the Melsunger Strasse in Spangenberg, looking towards Schloss Spangenberg on the hill. The original image is here. Many other images of the renovated building can be found online, see here. 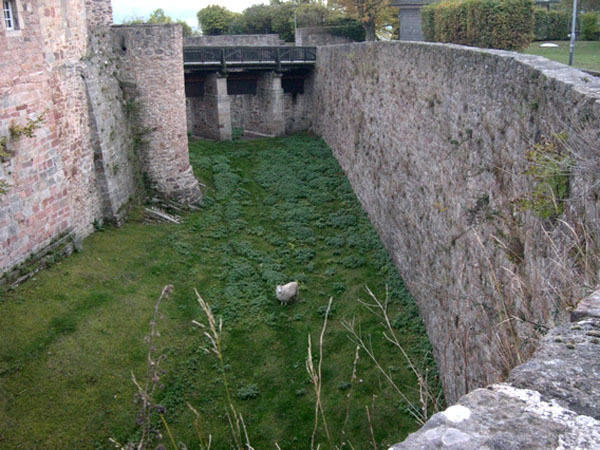 But I was excited to find this one, taken by Dave Black in 2005, which shows the moat, and could indeed be the area in which the POWs are standing in the photo of the curling above. Compare it for yourself! My thanks go to Ian Seath for bringing the Oflag IX A/H curling photo to my attention, and for his encouragement in helping me to unravel this story, and to Peter Green for much help and advice. If anyone reading this can add any further information, please get in touch. However trivial an article about POWs curling might seem to some, it is not my intention to detract from the hardships that so many suffered in POW camps during WW2. "Lest we forget." Postscript: In 1945 and 1946 no fewer than 130 pairs of curling stones were sent out to Germany for use by troops stationed there after the war. But that's another story! Thanks, Bob! Great research for a very interesting story. Fantastic story. Thank you so much for sharing it. Brilliant piece of research, Bob. An amazing story, really well researched and presented. Many thanks. Thank you Bob, a fascinating story. You have opened our eyes to yet another facet of WWII; one we will never forget.